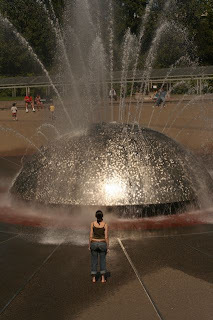 Pictured above is Seattle's International Fountain, which, it turns out, on sunny days in June, is a Happiness Machine. You can tell, because it sits there in it's giant, handicap accessible inverted concrete dome, and it sprays out wanter and steam in strange and ever changing patterns, and everybody within a 100 foot radius or so complete forgets their dignity and just gets happy. There are, of course, a plethora of children of all colors and shapes and sizes playing with the spray, running up to touch the shiny dome in its sparkly coat of water, running back and giggling and running around some more. And with the children, of course, there are parents, pleased that their little darlings are, for once, being darling, and getting wet and giggly themselves. But the people in whom the effects of the Happiness Machine were most evident were the teenagers. Disaffected, saggy-shorted, wallet-chained boys and too-cool, slouchy-jeaned, tank-topped girls were pushing each other in and out of the jets, and playing the same touch-the-dome game and the kids and the parents and the grandparents. They had succumbed. They were not, for that brief period, disaffected, or cool. They were simply happy, reduced the same level of pure, sunlit joy as everybody else in the area. Boy and I, of course, were right there with them. This is a picture of little Switch staring transfixedly up at the water, utterly joyous, completely enraptured. What we thought would be a brief stop to look at a fountain became an hours play time which left us refreshed and not entirely willing to leave. Hooray, Seattle. Hooray, the Happiness Machine. there's a playground in somerville that has the same effect. you should see it surrounded by aging hippies and goth teenagers and street performers and grinning little kids during bumbershoot (awesome music festival in august). by the way, fremont fair is this saturday and if you are around you should definitely check out the parade.